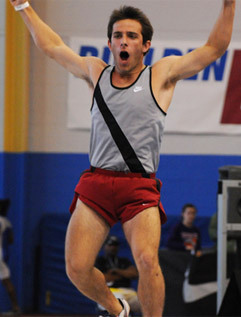 Long on talent, but somewhat short on confidence, Arkansas pole vaulter Jason Pelletier needed something to provide an extra boost heading into Saturday’s vaulting final at the 2008 Nike Indoor Nationals. It didn’t come from adding a few additional steps to his approach or changing the grip height on his vaulting pole or shotgunning a Redbull. The lift Pelletier sorely needed came from a handwritten note that Morry Sanders, his coach at the Arkansas Vaulting Club, scribbled and slipped into his shoe the night before the meet. In critical moments, you’re only as good as you believe you are. That’s when you have to believe that nobody can beat you. Relax and own the runway. Have fun. What was the encouragement contained in that carefully-folded note worth to Pelletier? About eight inches, as it turns out. By Saturday afternoon, the Bryant AR senior was facing the crucible of a looming third-attempt clearance at a height more than half a foot higher than he’d ever gone, with the majority of his competition eliminated and a national championship on the line. 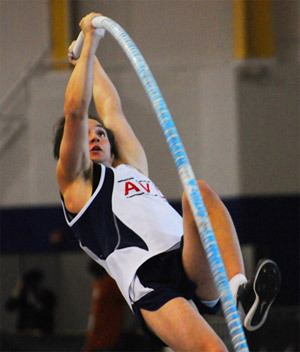 In an event lacking substantial star-power, with Nico Weiler—the winter’s sole high school seventeen-footer—competing north on I-95 at the National Scholastic Indoor Championship in New York City, Pelletier and his five fellow vaulters remaining at 16-06.50 hijacked the track meet, staging a trackside vaulting party on a runway that conveniently faced the homestretch grandstand. Clapping rhythmically for each other, imploring the crowd to do the same, celebrating key clearances with fist pumps and high fives, and generally expressing the joy you’d expect from a band of overachievers exceeding expectations on the sport’s biggest stage, the six vaulters dragged the fans into a personal drama unfolding seventeen feet above the arena floor. Along with Pelletier, at least two more of the six probably had no business making it to this point. David Slovenski, a Brunswick ME senior, was attempting to scale higher than any schoolboy from New England ever had in the vault. His own PR of 16-02.50, achieved in the Maine state meet, was already a state record; now he was setting out for wider territory. Riley Egan (right), a senior at St. Thomas Aquinas HS in Florida, may have been the longest shot of all. He entered the competition with a PR of 15-8, and rightfully commemorated each new clearance beyond that as if it was his last. Scott Houston (Northwest Guilford NC sr) and Joe Wesley (Marine City MI sr) had both been over 16-10 previously this winter, PRs that left them the sole members of the final six who weren’t in over their proverbial heads at 16-6. Junior Corey Shank (Northrup IN) had a seasonal best of 16-04.75, but was perhaps the most feared vaulter in the competition, as he’d managed 17-feet last spring and brought that big jump experience into Landover, even in the midst of injuries that had derailed his promising upward swing. It was Shank who played the biggest card at the 16-06.50 bar, passing on his final attempt after two misses and then settling back to see who might join him for his single try at 16-10. None of the other vaulters could afford that sort of gamesmanship, but each somehow found a way over, advancing all six to the next height. Egan, with his pre-meet PR of 15-8, had cleared 16-06.50 on his first attempt, continuing a string that stretched to the beginning of the final. It set up the tantalizing possibility that a sub-16 foot kid could take the entire competition. Slovenski, the Maine record-holder, was the last to advance, slipping his lean frame and helmeted head over a height that had seemed improbable only minutes earlier. Shank was the first casualty at 16-10.25, his risky gambit failing to pay off when his missed his sole attempt at the bar. That left five remaining. One by one they took tired-looking shots at a mark only one of them (Joe Wesley) had ever surpassed. The excitable Egan, his record clean up to this point, went down in three admirable attempts. As did Scott Houston and Joe Wesley. Jason Pelletier, his coach’s words still running through his mind, stared down the runway at 16-10.25 with two misses on the books, knowing that if he hit this height, there was only Slovenski left to match him. In critical moments, you’re only as good as you believe you are. He’d needed three clearances to make two of the earlier heights, so Pelletier felt fortunate to even still be in the competition this late in the game. It was something he and his coach were learning: in big meets Jason had a tendency to clear heights on third attempts, and he tended to bring a lot of energy to those jumps. Energy that propelled him deeper into the pit and presented the risk of blowing through the jump. As Pelletier squinted down the runway at his golden opportunity, he made a split-second decision that may have altered the outcome. Setting down his pole, he jogged to the adjustable sign which notifies the pit officials how far back to set the standards, and changed the displayed numbers from 60 to 70, moving the standards 10 inches deeper into the pit. Relax and own the runway. He gathered up his pole again, allowed the far end to brush the runway, gave it a snap that shuddered through its length, and let the momentum carry the pole into position for the approach. As his fellow vaulters led the crowd in a coordinated clap—with all but Slovenski already eliminated—Pelletier powered down the runway, buried the pole into the box, and rode the forces generated over 16-10.25. That, and the final words from his coach’s note. Pelletier’s impromptu mat celebration was one of the great moments of exultation at the weekend meet. He thrust his fists at the ceiling, leaped up, tumbled back to the mat, pressed his head in disbelief into the cushiony surface, and danced out of the pit. Not quite a national champion yet, but almost. After Slovenski missed his final attempt, Pelletier made three game tries at 17-feet, but they were the work of a young man who’d left everything on the runway in the earlier rounds. The title was already his, and seventeen feet would wait for another day. Impressively, Pelletier is the second vaulter from his high school to attempt seventeen feet in the last two years. 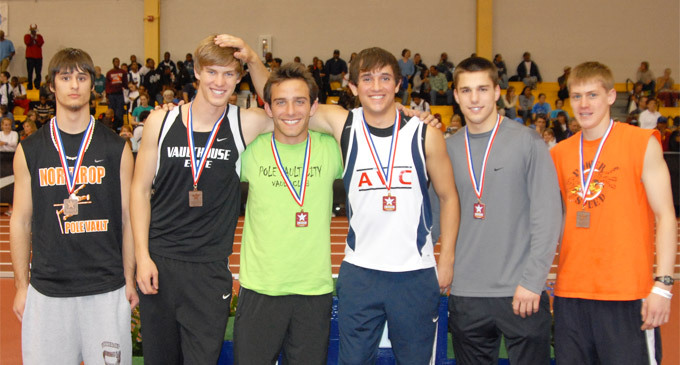 Former Arkansas Vault Club and Bryant High teammate Spencer McCorkel was a 17-footer indoors and out as a senior, winner of the 2007 Nike Outdoor Nationals, runner-up at Nike Indoors, and holder of a dazzling high school PR of 17-09. Although Pelletier has a way to go until he matches his predecessor’s accomplishments, he isn’t reluctant about sharing the impact McCorkel has had on his career. Armed with McCorkel’s mentoring and some timely words from his coach, Pelletier made it two Nike national meet wins in a row for Arkansas Vault Club and Bryant High School. That, and a handwritten note tucked in a shoe the night before the meet. The final six: Corey Shank, Scott Houston, Riley Egan, event winner Jason Pelletier, Joe Wesley and David Slovenski.